Privacy is a basic human right and I will always fight to protect this right. 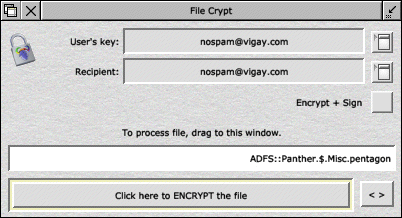 FileCrypt is a simple utility for securely encrypting individual files using Gnu Privacy Guard (GPG) for maximum, military grade encryption. It's designed to be as simple to use as possible, with a straight-forward drag and drop interface. Full source code is provided, so that a) people can confirm there are no hidden backdoors and b) RISC OS programmers can see how to build a simple wimp interface to their applications. enables you to encrypt all your sensitive data or to retrieve it, in a very simple manner. You can encrypt and decrypt not only single files, but whole directory structures in one operation. of MB, to run on lower memory and/or older machines. c) Added verification of signature on signed+encrypted files. d) Added improved error checking for availability of GnuPG. e) Added memory check to ensure 940K is available before calling GnuPG. local user are passed to GnuPG. h) Made main window bigger, to allow for more characters being visible in key icons. output anything if not detected. j) Made some icons wider to allow for larger desktop font sizes. a) Added Encrypt+Sign option to encrypt and sign files. processed, rounded up to next MB, which should be big enough. b) Extended icons in templates. c) Made passphrase appear as *'s (instead of nothing). d) Added -no-show-photos option to GPG when reading keyring. e) Extended maximum number of keys to read from keyring to 200.
f) Added pointer change when over menu icons.